ESO is releasing a magnificent VLT image of the giant stellar nursery surrounding NGC 3603, in which stars are continuously being born. Embedded in this scenic nebula is one of the most luminous and most compact clusters of young, massive stars in our Milky Way, which therefore serves as an excellent “local” analogue of very active star-forming regions in other galaxies. 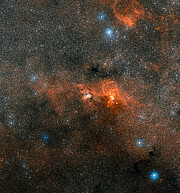 The cluster also hosts the most massive star to be “weighed” so far. NGC 3603 is a starburst region: a cosmic factory where stars form frantically from the nebula’s extended clouds of gas and dust. Located 22 000 light-years away from the Sun, it is the closest region of this kind known in our galaxy, providing astronomers with a local test bed for studying intense star formation processes, very common in other galaxies, but hard to observe in detail because of their great distance from us. The nebula owes its shape to the intense light and winds coming from the young, massive stars which lift the curtains of gas and clouds revealing a multitude of glowing suns. The central cluster of stars inside NGC 3603 harbours thousands of stars of all sorts (eso9946): the majority have masses similar to or less than that of our Sun, but most spectacular are several of the very massive stars that are close to the end of their lives. Several blue supergiant stars crowd into a volume of less than a cubic light-year, along with three so-called Wolf-Rayet stars — extremely bright and massive stars that are ejecting vast amounts of material before finishing off in glorious explosions known as supernovae. Using another recent set of observations performed with the SINFONI instrument on ESO’s Very Large Telescope (VLT), astronomers have confirmed that one of these stars is about 120 times more massive than our Sun, standing out as the most massive star known so far in the Milky Way . The clouds of NGC 3603 provide us with a family picture of stars in different stages of their life, with gaseous structures that are still growing into stars, newborn stars, adult stars and stars nearing the end of their life. All these stars have roughly the same age, a million years, a blink of an eye compared to our five billion year-old Sun and Solar System. The fact that some of the stars have just started their lives while others are already dying is due to their extraordinary range of masses: high-mass stars, being very bright and hot, burn through their existence much faster than their less massive, fainter and cooler counterparts. The newly released image, obtained with the FORS instrument attached to the VLT at Cerro Paranal, Chile, portrays a wide field around the stellar cluster and reveals the rich texture of the surrounding clouds of gas and dust. The star, NGC 3603-A1, is an eclipsing system of two stars orbiting around each other in 3.77 days. 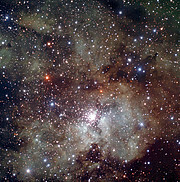 The most massive star has an estimated mass of 116 solar masses, while its companion has a mass of 89 solar masses. ESO, the European Southern Observatory, is the foremost intergovernmental astronomy organisation in Europe and the world’s most productive astronomical observatory. It is supported by 14 countries: Austria, Belgium, the Czech Republic, Denmark, France, Finland, Germany, Italy, the Netherlands, Portugal, Spain, Sweden, Switzerland and the United Kingdom. ESO carries out an ambitious programme focused on the design, construction and operation of powerful ground-based observing facilities enabling astronomers to make important scientific discoveries. ESO also plays a leading role in promoting and organising cooperation in astronomical research. ESO operates three unique world-class observing sites in Chile: La Silla, Paranal and Chajnantor. At Paranal, ESO operates the Very Large Telescope, the world’s most advanced visible-light astronomical observatory and VISTA, the largest survey telescope. ESO is the European partner of a revolutionary astronomical telescope ALMA, the largest astronomical project in existence. ESO is currently planning a 42-metre European Extremely Large optical/near-infrared Telescope, the E-ELT, which will become “the world’s biggest eye on the sky”.